In the present study, we tried to evaluate the results of surgically assisted rapid maxillary expansion for hypoplastic maxilla. A prospective study was performed, including 15 patients who underwent anterior segmental maxillary osteotomy and distraction of anterior segment using hyrax expansion screw admitted in Post Graduate Department of Plastic Surgery, King George's Medical University, Lucknow, between October 2014 and December 2015. Patients having age more than 14 years with maxillary hypoplasia with cleft lip and palate and with maxillary alveolar cleft who have been grafted and undergone presurgical arch alignment were included in the present study. All syndromic patients and patients with other systemic illness and not willing for follow-up were excluded from the study. A written informed consent was obtained from each patient before including in the study. Pre- and post-operative photographs, lateral cephalogram, posteroanterior cephalogram, and orthopantomogram were obtained [Figure 1] and [Figure 2]. Photographs were obtained in standard conditions with the same camera (Sony Cybershot DSC-HX60V 20.4MP Digital Camera) and setting by single person for all patients. All the measurements made on dental models were taken with digital vernier calipers (Aerospace DigimaticVernier Caliper, Size: 0–150 mm). Criteria for selecting patients for orthognathic correction included molar occlusion relationship of mandible and maxilla, occlusal discrepancy, and anterior dental crowding. Patients with Class III molar relationship with occlusal discrepancy <8 mm and anterior dental crowding were taken for anterior segmental maxillary osteotomy and rapid expansion with hyrax expander. After cephalometry for orthognathic surgery, the patients were planned for presurgical orthodontia for dental decompensation. Revaluation of patient and planning was finalized before surgical intervention. 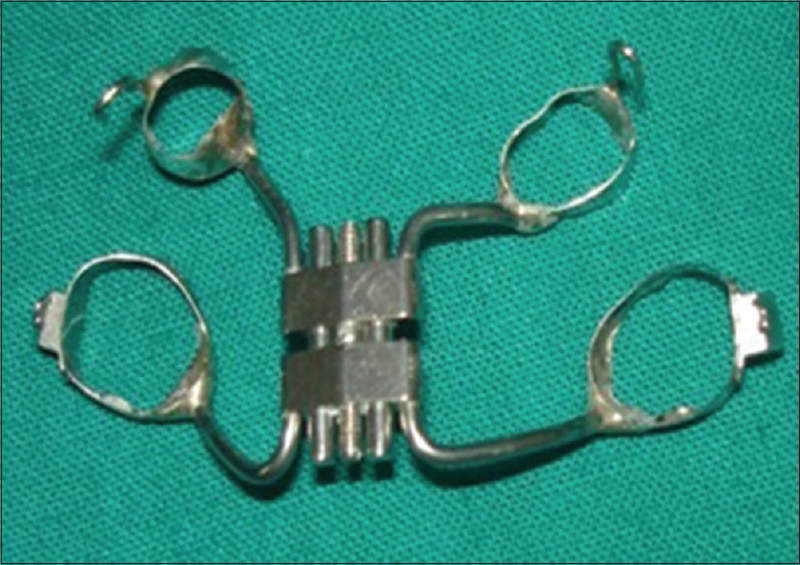 Palatal expansion screw was used (Leone 11 mm Rapid Palatal Expander) [Figure 3] for anteroposterior maxillary expansion which was customized for patients in the maxillofacial laboratory to form tooth-anchored expander device which was fabricated to accommodate on the first premolar and first molar teeth on their respective sides. Postoperative comparative cephalometric study and evaluation of dental model were done at the time of distractor removal at 3 months' and at 6 months' duration. Preoperative records were denoted with T0, postoperative records at 3 months as T1, and final records at the end of 6 months as T2. Latency period in the present study was 7 days, distraction phase where the tooth-borne device was activated by two one-quarter turns (0.5-mm advancement) per day to achieve a theoretical 1-mm advancement in 2 days, followed by consolidation phase of 3 months where maxillary expansion or advancement was achieved by distraction osteogenesis (DO). All the data analyses were performed using IBM SPSS Ver. 20 software (IBM, Armonk, New York, USA). Data are expressed as number (percentage) and mean ± standard deviation, Student's t-test and ANOVA were used to compare mean between groups. Significance level was assessed at 5% level. Out of 15 patients, maximum (11 [73.33%]) were female compared to male (4 [26.66%]). The mean age of the study cohort was 18.28 ± 2.74 years. The characteristics of the enrolled patients are summarized in [Table 1]. Mean sella–nasion–A point angle (SNA), sella–nasion–B point angle, A point–nasion–B point angle, Angle of convexity, Point A to N perp., Point B to N perp., Pog to N perp., N-ANS, ANS-Gn, Mandibular plane angle, ANS-PNS, Ar-Go, Go-Pog, Ar-Go-Gn, Occlusal plane angle, Ao-Bo, Maxilla to Nasal floor, G-Sn-Pog, Nasolabial angle, Ls-Sn-Pog, Li-Sn-Pog, Sn-G Perp, Angle's class, Inter Pm, Inter M, Overjet, Overbite, and Mean space created on one side were 75.13 ± 4.64, 77.47 ± 4.19,-2.33 ± 2.79, 6.13 ± 8.56, −7.87 ± 3.00,-6.73 ± 3.81, −12.20 ± 8.74, 48.67 ± 6.75, 54.87 ± 33.81, 28.93 ± 7.26, 43.40 ± 2.77, 42.40 ± 3.94, 72.07 ± 7.77, 126.53 ± 7.01, 12.40 ± 2.90, −5.33 ± 3.72, 106.73 ± 11.87, 14.00 ± 6.38, 94.80 ± 28.48, −1.93 ± 1.39, 4.27 ± 1.98, −2.20 ± 1.78, 3.00 ± 0.00, 31.17 ± 4.19, 43.54 ± 3.27, −4.80 ± 1.23, −1.04 ± 3.05, and 0.00 ± 0.00, respectively, in patients measured preoperatively (T0) on lateral cephalograms and dental models. 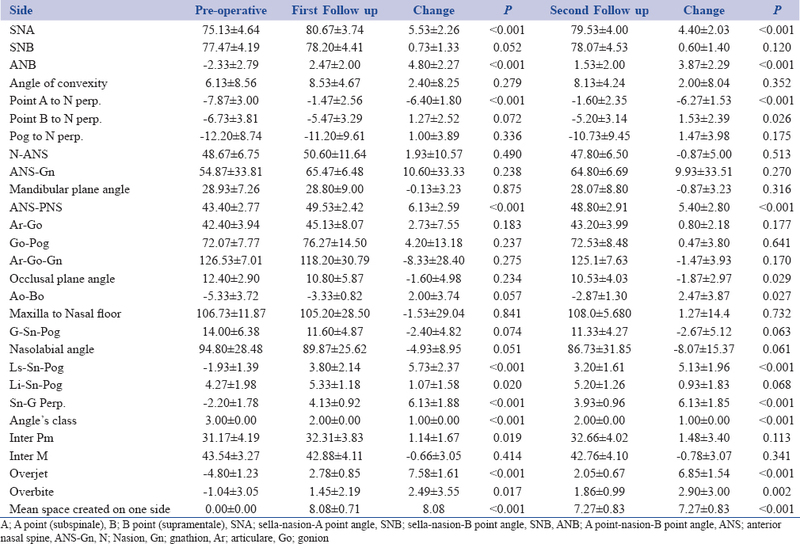 Pattern of change in cephalometric parameters is shown in [Table 2]. Comparison of outcome factors revealed that improvement in voice, occlusion, social interaction, and satisfaction was recorded in 93.3%, 100%, 100%, and 100% patients, respectively. DO using hyrax screw incorporated in an acrylic plate was found to be effective in the treatment of cleft lip and palate in a patient suffering from maxillary deficiency. DO is now being used to correct a wide range of craniofacial defects. In the present study, distance between ANS and PNS was significantly improved in patients sufficiently enough to accommodate the anterior maxillary crowding. Furthermore, concave profile of patients improved significantly. Showkatbakhsh et al. 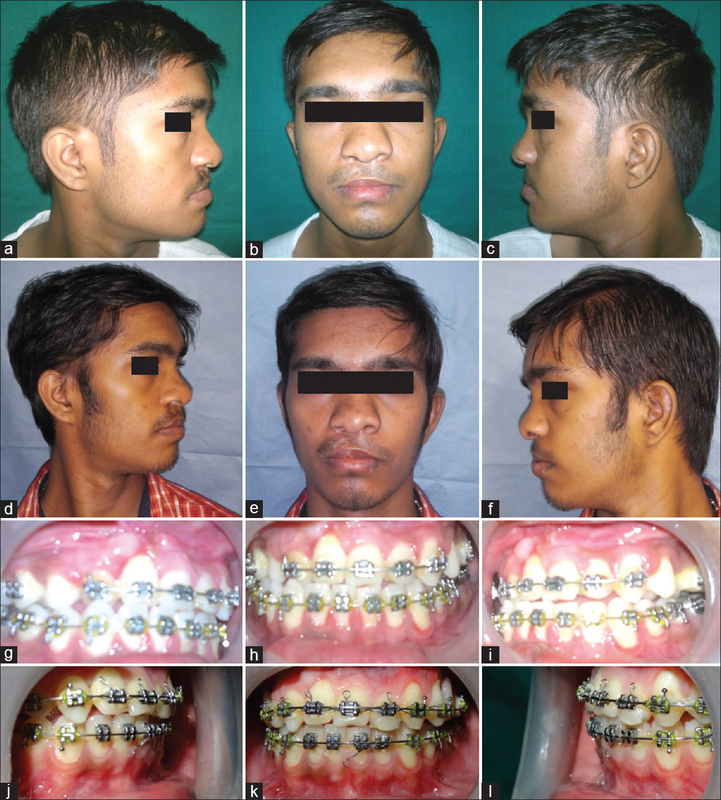 presented a case of 17-year-old boy with Class III malocclusion, maxillary deficiency, and cleft lip and palate who underwent internal DO for treating maxillary hypoplasia; in agreement to the present study, the author reported 5° increase in SNA angle and comprehensive improvement in patient's hypernasality. Space created in alveolar arch was measured separately on the left and right side of arch in the present study. The calculated mean was 8.08 ± 0.71 mm at the time of removal of palatal expansion screw at 3 months. At the end of the 6 months, a slight difference was observed in mean space created on one side of alveolar arch with a mean value of 7.27 ± 0.82 mm. Advancement of maxilla in relation to cranial base can be addressed with the changes in SNA angle and relation of point A to N perpendicular. For measuring the changes in vertical height of maxilla parameter, N-ANS, that is, the distance between nasion-to-anterior nasal spine was taken. We did not find any significant change in the vertical height of maxilla of patients for evaluating the changes in soft-tissue profile. The mean value of Sn-G-perpendicular, which depicts the distance between the point soft-tissue subnasal and perpendicular from the glabella of was −2.20 ± 1.78 mm preoperatively and 4.13 ± 0.92 mm and 3.39 ± 0.96 mm postoperatively at 3 months and 6 months, respectively. Gunaseelan et al. reported the use of palatal distractor in anteroposterior direction to advance a retruded maxilla after an alveolar osteotomy. Gunaseelan et al. modified hyrax screw and demonstrated an optional technique which involved distraction of the entire segment of the cleft anterior maxilla by a tooth-borne palatal distractor. Long-term follow-up study by Huang et al., including DO-treated patients with rigid external distractor concluded that distracted segment moves anteriorly and downwards, and no further growth was seen after distraction in cleft patients. In another study by Wen-Ching et al., who performed maxillary advancement with DO reported that the procedure increases nasal projection, normalizes the nasolabial angle, and makes the upper lip more prominent. Long-term results of DO of the maxilla and midface reported by Wiltfang et al., showed that cephalometric and clinical evaluation after follow-up period of 24 months revealed stable results concerning the skeletal and dental relations. The present study results are in agreement with Wiltfang et al., showing similar findings of stable movement after 6-month follow-up. Srivastava et al. reported that anterior maxillary distraction is a reliable technique for correction of midfacial deformity arising out of cleft lip and palate with negligible incidence of complications compared to total maxillary distraction. Prathap et al., in their review, reported that tooth-borne device hyrax provided good skeletal stability of distracted anterior maxillary segment. Distraction forces when directly transferred to the bone resulted in significant dentoalveolar compensation. Improvement in voice and social interaction is subjective evaluation by patients as per their experience on conversation with family and friends and their responses received by the patients. Based on that, we conclude that by employing maxillary hyrax distractor, a successful treatment outcome, including improvement in dental occlusion, voice, social interaction, and overall satisfaction with the surgical procedure, was achieved in maxillary deficient cases suffering from cleft lip and palate. Shetty A, Shetty A, Bonanthaya K, Shetty P, Rao D. Treatment of severe maxillary cleft hypoplasia in a case with missing premaxilla with anterior maxillary distraction using tooth-borne hyrax appliance. APOS Trends Orthod 2015;5:220-4. Guyette TW, Polley JW, Figueroa A, Smith BE. Changes in speech following maxillary distraction osteogenesis. Cleft Palate Craniofac J 2001;38:199-205. Chacko T, Vinod S, Mani V, George A, Sivaprasad KK. Management of cleft maxillary hypoplasia with anterior maxillary distraction: Our experience. J Maxillofac Oral Surg 2014;13:550-5. Altuna G, Walker DA, Freeman E. Surgically assisted-rapid orthopedic lengthening of the maxilla in primates – Relapse following distraction osteogenesis. Int J Adult Orthodon Orthognath Surg 1995;10:269-75. Showkatbakhsh R, Pourdanesh F, Jamilian A, Ghorbani A, Behnaz M. Hyrax application as a tooth-borne distractor for maxillary advancement. J Craniofac Surg 2011;22:1361-6. Gunaseelan R, Cheung LK, Krishnaswamy R, Veerabahu M. Anterior maxillary distraction by tooth-borne palatal distractor. J Oral Maxillofac Surg 2007;65:1044-9. Huang CS, Harikrishnan P, Liao YF, Ko EW, Liou EJ, Chen PK, et al. Long-term follow-up after maxillary distraction osteogenesis in growing children with cleft lip and palate. Cleft Palate Craniofac J 2007;44:274-7. Wen-Ching Ko E, Figueroa AA, Polley JW. Soft tissue profile changes after maxillary advancement with distraction osteogenesis by use of a rigid external distraction device: A 1-year follow-up. J Oral Maxillofac Surg 2000;58:959-69. Wiltfang J, Hirschfelder U, Neukam FW, Kessler P. Long-term results of distraction osteogenesis of the maxilla and midface. Br J Oral Maxillofac Surg 2002;40:473-9. Srivastava D, Ghassemi A, Ghassemi M, Showkatbakhsh R, Jamilian A. Use of anterior maxillary distraction osteogenesis in two cleft lip and palate patients. Natl J Maxillofac Surg 2015;6:80-3. 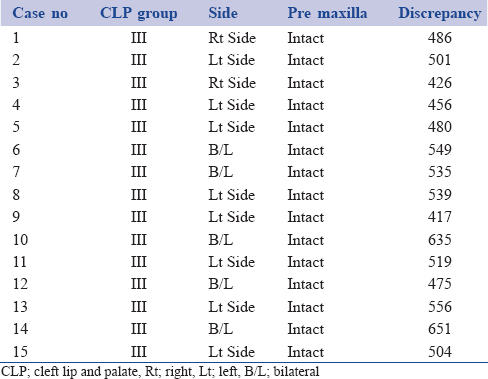 Prathap M, Varun Menon P. Techniques for the treatment of maxillary hypoplasia in cleft patients: An overview. Sci J Clin Med 2016;5:59-63.